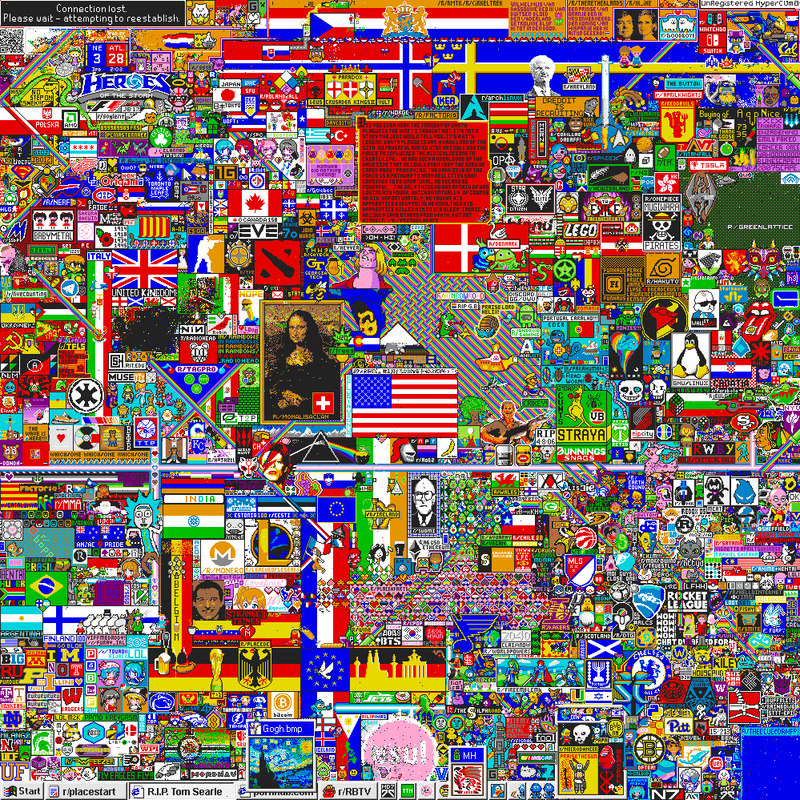 ‘Place’ is Reddit’s new obsession. There is an empty canvas. Together you can create something more. Redditors quickly discovered how Place works: Anyone with a Reddit account can place colored pixels on the board; the catch is that you can only change one square every five minutes. That makes it very difficult to draw a coherent picture unless you coordinate, which is exactly what factions from various countries and subreddits started doing. Place started out with a few landmarks that were easy to draw, like a blue corner and a rainbow road, but it has since evolved into carefully orchestrated pixel art of video games, anime characters, logos, and national flags. It’s hard enough to draw something large and elaborate as a group, and it’s even harder to keep it from being painted over by opponents and vandals. The American flag has been redrawn several times after assaults from other countries as well as attempts to replace it with a rainbow. Other major features of the place landscape include a Windows task bar at the bottom of the screen (complete with Start button), a large green lattice in the upper right corner, and the entire “Tragedy of Darth Plagueis the Wise” from Star Wars prequel Revenge of the Sith, which became a meme earlier this year. The Void isn’t killing Place, but scripting might be. Rather than forming large groups and working together to build big images, some people have automated the process and used multiple bot accounts to control the board on their own. Users are begging Reddit to add a captcha to Place, so only humans can edit the pixels and fair play will be restored. It’s not clear how long Place will last, or whether the experiment will be sustainable, but for at least one weekend, it changed the entire nature of Reddit. Update 12:40pm CT, April 3: The place experiment officially ended at noon central time today, after 72 hours. This is the final result. Update 6:14am CT, April 4: Here is a time-lapse of the entire process.